From 1 July 2014 significant changes to Women’s Services in Glebe and other inner city areas will begin to take effect. The changes which are pending result from the implementation of the Going Home Staying Home program that is being undertaken by the NSW Department of Family and Community Services. On 13 June the recently appointed Minister Gabrielle Upton announced that the $515 million package would now include the restoration of funding to the inner city. Although ‘the new system will still include specialist services for specific target groups, such as women,’ what is not specifically said is that many long-term existing services will be closing. Women’s services providers in Glebe include the iconic Elsie Women’s Refuge, the first shelter for women and children escaping domestic violence which has helped women for over 40 years. Another specific women’s service provider found in Glebe is Detour House, a specialist women’s refuge and rehabilitation centre for women with drug and alcohol dependency issues. With decades of established trauma-informed expertise, collaborative casework and referral pathways these are women’s only services, established by women for women. They understand the complexities and effects of homelessness, violence, substance use, child sexual abuse, mental health issues and trauma. These services are essential to the health and safety of vulnerable women and children. It is worth noting here that the Manager of Detour House, Kerri Betteridge informed me only last Friday that in the 30+ years it has served the community, 100% of its clients have been traumatised by sexual assault and/or family violence and 95% have been diagnosed with mental health issues. Elsie Women’s Refuge will continue but it will no longer be managed by Domestic Violence NSW. It will now be operated by the winning tenderer, St Vincent de Paul Society in the same building (which is owned by Land and Property NSW). There will be a three month transition period. Gillian Cohen, the present General Manager indicated that the outreach service provision, to follow up and support people after they leave the residential service, and verified that they were to be ‘women only’ services. As many people who access these services are ‘complex needs’ clients who are not suited to generic service provision facilities, it is to be hoped that the ‘women’s only’ services remain just that, as promised. This does not suggest that other homeless people be ignored, but rather, that women’s services require separate provision. With its diversity and inner city location, Glebe is an ideal and necessary location for women’s services. It is therefore in the interest of our wider community that we continue to observe and monitor this situation. Should any difficulties become evident locally due to these changes, the Glebe Society, which has already written to the Minister, will continue to seek continuation of these services. Click here to read the letter from the Glebe Society to the Minister for Family and Community Services. 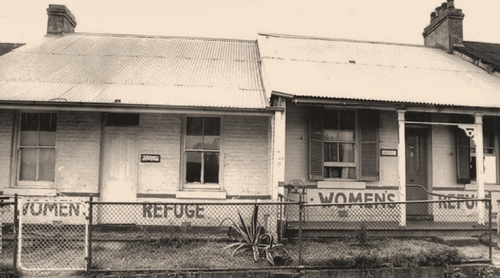 Elsie’s Refuge – Glebe NSW was the first Women’s Refuge in Australia. It will now lose its community identity and its personal relationship with local services such schools, Police and other local support agencies etc. The staff members are in the process of taking redundancies, hence the loss of local knowledge, trust and experience. Minister Gabrielle Upton (Letters, Sydney Morning Herald July 5th June) needs to account for why about 40 women’s refuges/services are facing closure. NSW Government outsourcing to Corporate Faith-based NGOs – St Vincent de Paul (in the Inner West) winning the tender will ensue a different approach and possibly change of direction, with no guarantee that existing services will continue. To date, the government has not produced any evidence that the service was not effective and helpful to many women. It is an unfortunate irony that Elsie turns 40 this year and local residents have obtained a City of Sydney Community Grant to paint a mural reflecting the history of the refuge.